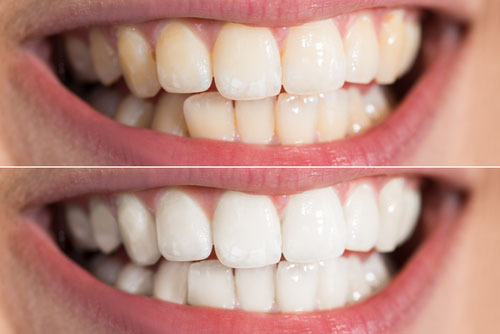 Tired of having discolored teeth? A brighter, whiter smile is just an appointment away. At Fischer Family Dentistry, we offer a variety of teeth whitening solutions. We want you to feel confident about your teeth. Having a whiter smile can make a huge difference to your overall appearance. We offer quick, painless options to dramatically improve the color of your teeth. Professional teeth whitening offers patients the best results in a relatively short amount of time! We’ll apply a hydrogen-peroxide-based gel to your teeth, and then activate it with a special light. Your gums and lips are protected during this time. The process is completely safe, and painless. If you can sit still for the length of a movie, you can handle this procedure. It will remove deep stains from your teeth, and dramatically increase their whiteness. Countless patients have chosen this easy, affordable option. And the results are immediate. You’ll leave our office with the bright smile you’ve always wanted. We’ll instruct you on how to maintain the new color of your teeth. You should avoid certain foods and drinks for optimal results. We also suggest that you avoid smoking. Cigarette smoke has a yellowing effect on both natural and whitened teeth. With proper care, the effects of professional teeth whitening can last for years. We offer custom take-home bleaching trays for patients who prefer the convenience of whitening at home. This is an easy, affordable option that many of our patients have used with great success. With these, you’ll notice the effects over the course of about a week. And you control the level of whitening that you desire. These trays are also helpful to maintain the effects of Zoom Whitening over time.